Gift cards are seen by some as a lazy gift, suggesting that not much thought went into the gift selection. Others, though, welcome the gift-card solution to a holiday shopping list -- and are happy to receive them, too. Gift cards have become widespread in recent years, and you probably have some in your possession already. Whether you're buying and/or receiving gift cards, though, there are a bunch of rather important things to know about them. The more you know, the fewer headaches you'll experience. See which of the following gift card facts surprise you -- and which ones will save you some money. For starters, understand just how big the gift-card market is. The National Retail Federation has estimated that gift card spending will total $27.6 billion this holiday season, and that those buying cards will buy about four cards each, with an average value of $45. That's just for the holiday season. Gift cards are also bought for other occasions, such as birthdays, and the total spending over the year is estimated at around $160 billion for 2018, up from nearly $100 billion in 2011. While you might think that buying someone a gift card is a bit of a cop-out when it comes to finding a perfect gift, the truth is that many people like and want them as gifts. 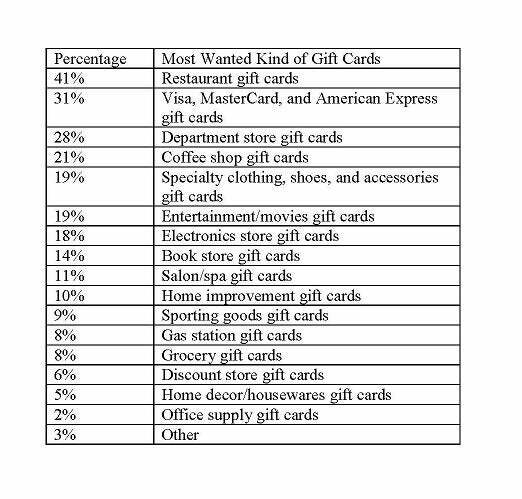 Fully 61% of folks will be asking for a gift card this year, per a survey by Prosper Insights & Analytics. That's not a new development, either: Gift cards are the most popular entry on holiday gift wish lists this year, according to the National Retail Federation and Prosper Insights & Analytics -- and for the 12th year in a row! Not only are many millions hoping for gift cards, many millions will be receiving them: According to that same survey conducted by Prosper Insights & Analytics, 59% of survey respondents said they will be purchasing gift cards for their loved ones this year. There are more kinds of gift cards than you can imagine, too -- covering everything from favored clothing retailers to drugstores, bookstores, restaurants, outdoor gear stores, sporting goods stores, department stores, craft stores, pizza vendors, music streaming services, video streaming services, and much more. Whatever your loved ones like, there are probably a bunch of cards that might suit them. About 90% of gift cards get put to use quickly, within 60 days of being received. What about the other 10%? Well, some of those cards are used later, of course, but a whole lot of them end up never used. Roughly $1 billion worth of gift cards go unused each year, per CEB TowerGroup. You might think that stores like it when you don't use their gift cards. Well, there is definitely an upside to that, but retailers actually win no matter what people do with their gift cards. If a $50 card is unused, that's $50 worth of merchandise or services that doesn't have to be provided. If $45 of a $50 gift card is used, there's $5 in value that various parties can profit from. And even if the entire card is used, there's a good chance that the total bill will be for more than $50, and that the shopper is spending more than they otherwise would have with the retailer. About 72% of gift-card users spend more than the card's value when using the card. Many people have learned the hard way that gift cards can expire. The Credit CARD Act of 2009 limited the aggravation that consumers experience by requiring most gift cards to not expire until five years beyond the date the card was purchased or the date on which funds were last added to the card. Don't let a gift card's expiration date take you by surprise. If you're giving a gift card, read the fine print first, to know the terms -- and perhaps give the recipient a heads-up about the rules, too. If you're the happy recipient of a gift card, if you're not planning to use it soon, it's smart to figure out when it expires, or to make a point of using it within five years. Being in possession of a bunch of gift cards can be tricky. You don't want to carry them around with you everywhere, but you never know when you might need or want to use one of them. Fortunately, there's an app for that! Several, actually. The Gyft app, for example, not only lets you buy (and send) electronic gift cards, but it also lets you upload your plastic gift cards, so that it can store them for you, and even back them up. Stocard is another app that makes your gift-card life easier. It lets you scan your plastic cards and add them to a "digital wallet," where you can manage them and other ways to save. One reason some gift cards go unused is because they end up lost -- or stolen. You can protect yourself from such happenings and minimize your losses by registering your gift cards whenever possible. You'll again need to consult the fine print that comes with your card, to see if you can register it and how to do so. Bank-branded gift cards tend to have registration features, and some cards for retailers do, too. Registration doesn't take long and typically includes you providing your name and contact information, the card's number, its PIN, and its expiration date -- or some combination of those items. Here's a terrific silver lining for any gift cards you have that you don't know what to do with: You can sell them online. You might have received a $100 card to a store you need nothing from, for example, or you might simply prefer to have some cash than to spend a card at its intended location. If so, head to sites such as cardpool.com, cardcash.com, cardhub.com, raise.com, or junkyard.com, where you can sell your unwanted cards, reaping up to about 70% of their stated value, generally -- and sometimes more than 90% of the value. Another option for unwanted gift cards that will sometimes work is returning them. Some retailers will take back a gift card, but will only offer you less cash than the card's face value -- for example, returning a $50 card may only net you $45. Still, that can be better than having a card you can't or don't want to use. Some retailers will require the receipt from the card's purchase, which you might not have, if you received the card as a gift without the receipt. Other retailers may simply offer an in-store credit -- which isn't very different from having a gift card, really. You might save yourself a trip to the retailer by first looking up its return policy online. Check your local discount warehouse to see what's available. If you're having trouble figuring out which gift cards would best serve certain recipients on your holiday shopping list, consider cards that are redeemable at multiple retailers. There are cards offered by financial companies such as Visa (NYSE: V), MasterCard (NYSE: MA), and American Express (NYSE: AXP), for example, which can be used in many thousands of locations. The giftcards.com site, meanwhile, offers a range of gift cards that are accepted at multiple retailers and/or eateries. The "happy guy" card, for example, can be used at Home Depot (NYSE: HD), Burger King, AutoZone (NYSE: AZO), and Buffalo Wild Wings, among other places. Here's another nifty thing to know about gift cards -- you may be able to snag some for yourself or others via the rewards points you've accumulated on your credit cards. Many of the best credit cards offer gift cards as a way to redeem points. That's not always the best use of your points, as you may get more bang for your points with other options. Still, if you're looking for a way to burn up some points and you could use a gift card or two, go for it. Here's a big problem with some gift cards: They're tied to companies that end up going out of business. If you're not paying attention, you may have some gift cards in your wallet or desk drawer that are no longer redeemable because a store has gone bankrupt. That kind of nasty surprise has made many card holders unhappy -- such as those who had Radio Shack gift cards, before it filed for bankruptcy protection. For minimal gift-card headaches, it's best to use any cards you receive quickly. Or at least be aware of what you have, so that you can use them quickly should you learn that a particular retailer is in trouble. Once a company has filed for bankruptcy protection, it may or may not honor its gift cards -- but it's worth checking, of course. If you're the frustrated holder of a gift card to a retailer that went out of business, you may still be able to get some value out of it. You can consider filing a claim for the value of your card with the bankruptcy court, for example. Gift card holders aren't high-priority creditors, but they sometimes get some payment. You might also just hang on to the card or documentation related to it, in case there's any kind of reimbursement offered later. You may or may not have noticed, but sometimes when you buy a gift card, you're charged a fee. That's often the case with Visa-, MasterCard-, or American Express-branded gift cards, which charge "purchase" or "activation" fees that range from about $3 to $6 per card. Those cards can be extra attractive, since they can be used just about anywhere, but paying $5 for a $25 or $50 card means you're paying 10% to 25% of the value of the card just to buy it. If you search online, you may occasionally find discount codes to use when buying these cards online -- that can reduce or eliminate a purchase or activation fee. Merchant cards, meanwhile, don't generally charge such fees -- so a $50 card should cost you $50. That's a big plus for them. Another dark side of gift cards is that you may get whacked by an "inactivity" fee. They used to be more common than they are today, but they're still around. The Credit CARD Act of 2009 reined them in a bit, allowing issuers to only charge an inactivity fee on a gift card if the card hasn’t been used in one year, and to only be able to levy one service charge or inactivity fee per month. It's smart to know what you're buying or what you've just received, so check the fine print of gift cards to see what kind of fees may be involved. Otherwise, the value of a card may be quietly shrinking. ALSO READ: 10% of Americans Expect to End the Holiday Season in Debt. Here's How to Avoid Being Among Them. --When you're called and asked to pay a utility bill by gift card before your power or water is cut off. -- When someone buys something from you online, sends a (fake) check for more than the purchase price, and requests a gift card with the difference. You get the idea. The bottom line is to not treat gift cards as currency and only use them as intended. One last scam is when a card's packaging has been tampered with in any way. In those cases, scammers may have gotten a card's numbers and perhaps even its PIN, and they may be able to use the card before you do. While you may be aware of general gift card rules and that federal regulations prohibit cards from expiring less than five years, know that each state can have its own gift card regulations that go beyond federal rules. Earlier this year, for example, Arizona passed a law prohibiting the sale of gift cards that have fees or expiration dates. There are a few exceptions and details, of course, but in general, that makes Arizona a good place to buy a gift card. Minnesota has similar rules in place for many, but not all, gift cards. It's a good practice to look up and know the local regulations for gift cards wherever you live and shop. You may assume that nothing much happens with unused gift cards, but they actually typically end up considered as abandoned property and can be liabilities to companies. Businesses often have to turn over unclaimed property to the proper state government -- and with many states quite strapped for cash, they're eager to get it. New York State, for example, received $11.6 million from unused gift cards last year. Each state has different rules governing "escheatment" -- the process of identifying and dealing with unclaimed, or "abandoned," property. You've probably figured out by now that it's smart to have a system for keeping track of your gift cards. Otherwise you'll run across random cards at random times, very often after they've expired or have had their value sharply reduced by inactivity fees. Aim to keep your cards in one place -- possibly in an app that you'll always have access to. You might set reminders for yourself, too, to use them. Some, for example, might be best used in a certain month -- such as a gift card to an ice cream shop -- so be sure you'll remember to use them at the best time. If you have some gift cards that you don't want or need, you have more options other than selling the cards or using them to buy clutter. For example, you might donate the cards to charity. A gift card can provide a tax deduction for the face value of the card, if it has been donated to a qualifying charity. If you're able to deduct $200 worth of gift cards and you're in the 24% tax bracket, you're looking at saving $48. Even better, the charity or charities will get up to $200 of value. One of the problems with gift cards is that most of us do use the gift cards we get -- and we often buy things we don't really need and would otherwise have done without. In other words, we can accumulate clutter due to gift cards. It's not a bad idea to stop and think for a little while before using a gift card -- ask yourself if you're going to be spending it on something you'd buy anyway or on something you'd really enjoy. If not, if you're just going to buy another set of bed sheets or a miter saw that you could just rent when you need it, consider selling or trading the card, instead. You can end up with a more usable card or with cash instead of clutter. Here's yet another strategy for dealing with gift cards that aren't a good match for you: Buy things with them and then sell the items. For example, if you got a gift card to a surf shop but you're no longer surfing, you might buy some surfing gear and then sell it on eBay (Nasdaq: EBAY) or Craigslist. Even if you don't get as much as the item originally cost, you may well get more than you would if you simply sold the card. A last option for gift cards you don't want is to sell them to friends or trade them with friends for cards you'd prefer. For example, if you've got a gift card to Netflix (Nasdaq: NFLX) but you already have the service or don't want it, you might sell it to someone who could use it. Or maybe your buddy has a gift card for the same amount for a restaurant or store you frequent. You might even make a big of a game of it -- invite friends over for a gift card party, where you all reallocate cards, either by selling or trading. Some folks aren't aware, but gift cards are not limited to just restaurants and retailers and some other familiar services and companies. You can give gift cards that offer the gift of travel to their recipients. There are gift cards for various hotel chains, for example, and for airlines, resorts, cruises, and car rental companies. There are even gift cards for Amtrak and Airbnb. You can also give "GO Cards" as gifts; they let their holders into many of a city's top tourist attractions over a defined period of time. Many people have trouble justifying staying at a luxury hotel, but with a gift card to one, they might enjoy a treat. It's the same with a train ride or airline gift card -- you may be giving someone an experience they'll love. Here's another not-so-great feature of gift cards: They tend to make you spend more than you would have otherwise. About 75% of people using gift cards spend more than the value of the card -- an average of $59 more, per a report by First Data. It's easy to see how it happens: You have a card for, say, $50, and you decide to buy a $42 item with it. You know you have $8 more you can spend, but instead of finding an $8 item, you end up buying a more costly item. So yes, you did get $50 worth of products or services free, but you also spent more money -- possibly on item(s) you didn't need or want all that much. In those cases where you have, say, a $50 gift card and want to buy something that costs less than $50, know that the retailer may give you the difference in cash. There's often a threshold set by law and various retailers have differing policies. If you wanted to spend $42, in some states or stores, you might get $8 back in cash and be done with the card -- while in others you might need to be buying something worth at least $45. It's always good to know the rules before you go spending so you can make savvy decisions. Try looking in the fine print associated with the card or at the retailer's website. It's important to remember that gift cards may seem a lot like a credit card, typically shaped the same and also made of plastic, but they're quite different. Good credit cards tend to come with a host of handy features, such as price protection, return protection (allowing you to return an item even if a store doesn't generally permit that), extended warranties, and waived fees for checked bags. Gift cards do not. It's smart to occasionally review your credit cards to see what features and perks they offer so that you can use them when you need them -- and not use gift cards when they're not your best choice. While you can get gift card bargains in online marketplaces, know that you may be taking on more risk than if you bought the card(s) at full price from a regular retailer. It's smart if buying from a stranger to check their reputation as a seller. If a bunch of other buyers are complaining about problems, you may want to steer clear. You might also look into what recourse you would have from the marketplace if a purchase turns out to be problematic -- will you get your money back, and how? While it's true that you can resell gift cards -- and that that has become a big business lately, it's also true that cards, kind of like used cars, vary in their re-sellability. The ones that keep their value best tend to be for national companies and ones that sell a wide variety of goods, rather than smaller, more local, niche retailers or eateries. After all, if a company has wide appeal and 2,000 locations across the country, gift cards to it will be of use to many more consumers and more potential buyers. Many people find it hard to justify certain expenses, such as treating themselves to a fancy $5 coffee or a $30 book they'd really like to read. Gift cards can help your loved ones treat themselves without guilt. A recent CashStar survey found 66% of respondents reporting feeling less guilty when they can buy something for themselves with a gift card. Among young adults aged 18 to 24, fully 79% feel less guilty spending with a gift card, and a hefty 78% of 25- to 34-year-olds feel the same way. Guilt is felt much more strongly by women (74%) than men (57%). Many gift card givers, meanwhile, feel guilt at giving gift cards instead of something more personal, but the fact that they can reduce feelings of guilt for recipients should assuage that. Americans plan to spend about 55% of their holiday gift budget on gift cards, according to a recent study by First Data. That should put to rest any fears that you'll look lazy for giving gift cards. On the other hand, it can also make clear that you can stand out this holiday season by bucking that trend and giving three-dimensional gifts -- perhaps even handmade items such as cookies, jams, sweaters, or woodwork. Perhaps surprisingly, fully 64% of Americans reported having bought at least one gift card for themselves, according to a recent First Data survey. For those who need a little help treating themselves on occasion, buying a gift card is a way to give yourself permission to buy some fancy coffees for yourself or to play an occasional round of golf. Once the money is spent on the card, you can justify using it for those purchases you crave. Selena Maranjian owns shares of American Express, Costco Wholesale, and Netflix. The Motley Fool owns shares of and recommends Mastercard and Netflix. The Motley Fool owns shares of Visa and has the following options: short February 2019 $185 calls on Home Depot and long January 2020 $110 calls on Home Depot. The Motley Fool recommends Costco Wholesale, eBay, and Home Depot. The Motley Fool has a disclosure policy.